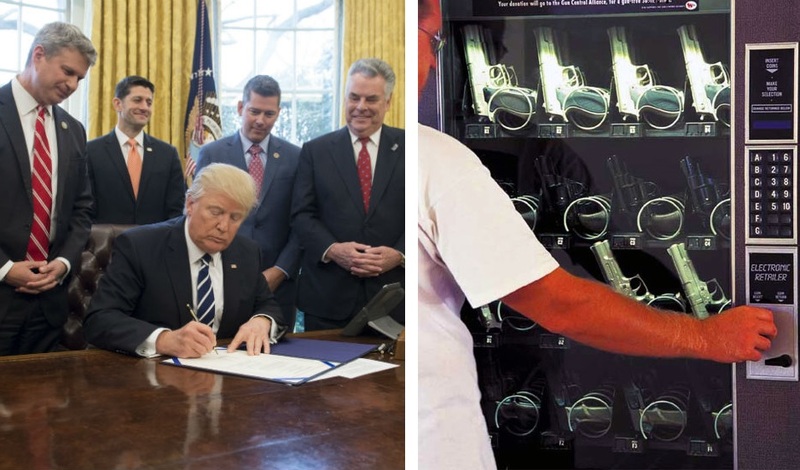 U.S. President Donald Trump fulfilled one of his election campaign promises this week when he legalised gun vending machines. The new weapon dispensers will soon be available to use in all 50 states and the President and his supporters hope they’ll become a common sight in shopping malls, airports and bars across America. The most controversial part of the new legislation is that it also allows for gun vending machines to be installed in schools and so far more than 18,000 colleges and high schools have ordered one. At a rally in Texas the day after signing the bill a defiant Trump hailed it as a great day for America. Every year more people are shot dead in the United States than in any other country on Earth but the President and his supporters do not believe America’s gun culture is to blame. We spoke to Chuck Johnson – head of one of America’s biggest gun enthusiast groups Christians 4 Guns – and asked him if he really believes having gun vending machines in schools is a good idea. President Trump also used the occasion to update his supporters on the progress of the wall he intends to build along the Mexican border, telling the crowd that the design is now in the final stages and that he believes the wall will be built and completely finished by the end of 2020. Mexican President Enrique Nieto meanwhile welcomed the announcement and said he intends to have his tunnel under the wall finished around the same time.